What Would It Be Like to Live on Pluto? 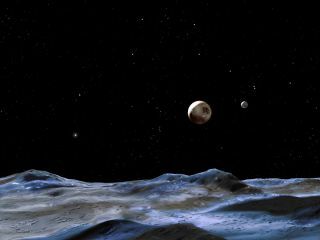 In this artist's concept, Pluto (at center) can be seen from one of the dwarf planet's moons. What would it be like to stand on Pluto's surface? In 2006, Pluto lost its status as a planet when it was reclassified as a dwarf planet, a move that caused much controversy and debate. Whether you believe Pluto should still be considered a full-fledged planet or not, one thing is certain: The object is shrouded in mystery, and we don't have a complete picture of what it would be like to live there. "We've never been to [Pluto] or anything like it," planetary scientist Alan Stern told Space.com. Pluto was considered a planet until 2006, when it was reclassified as a dwarf planet. See what conditions an astronaut might see on Pluto in our full infographic. If you lived on Pluto right now, it would take about 4.5 hours for your messages to reach home. But the exact amount of time it would take for such a message would vary greatly throughout Pluto's year, which lasts 248 Earth years. Pluto travels along a highly elliptical orbit that brings it inside Neptune's orbit for 20 years; during this time, when Pluto is closest to Earth, a message sent home would take about four hours. But when Pluto is farthest from Earth, that message would travel for over 6.5 hours before reaching its destination. Depending on where it is in its orbit, you can expect freezing temperatures on Pluto that vary from minus 369 degrees Fahrenheit (minus 223 Celsius) to minus 387 F (minus 233 C). This relatively small shift in temperature may also affect the dwarf planet's atmosphere. When Pluto is closer to the sun, the ices on the dwarf planet's surface sublimate (transform from a solid to a gas), creating a tenuous atmosphere. Computer models suggest this atmosphere allows for atmospheric winds of 225 mph (362 km/h) and a surface pressure that's currently about 3 microbars (Earth's surface pressure is 1 bar), though it's unknown what kind of weather patterns Pluto may have. It's expected that Pluto's atmosphere virtually disappears when the dwarf planet is farthest from the sun and the atmosphere's gases transition back to ice. Photos from the Hubble Space Telescope show that the surface of Pluto has large differences in brightness, suggesting the dwarf planet may have a varied landscape. But nobody knows what Pluto's geomorphology or geology is really like. If you were to go off exploring Pluto's surface, you shouldn't expect a long trip. Pluto is only about two-thirds as wide as Earth's moon and has about the same surface area as Russia. Additionally, its gravity is only one-fifteenth that of Earth's, so you'd only weigh 10 lbs. (4.5 kilograms) on Pluto if you weighed 150 lbs. (68 kg) on Earth. Pluto and its largest moon, Charon, are tidally locked, so one side of Pluto and one side of Charon always face one another. If you were standing on the side of Pluto facing Charon, the moon would appear quite large. As a comparison, on Earth, you could blot out the full moon with your thumb if you held out your arm, but it would take almost your entire fist to block Charon while standing on Pluto, Stern said. Pluto's next two largest moons, Nix and Hydra, would also be visible with your naked eye. Pluto's other kmown moons are Kerberos and Styx. At midday on Pluto (the dwarf planet's day is 6.4 Earth days), the sun would look like Jupiter does from Earth — like a fat star — though much brighter, Stern said. "The sun would be about as bright on Pluto as it is on the Earth on a very cloudy day." Finally, it's not clear what kinds of dangers you'd face on Pluto, aside from cosmic radiation and the cold. "Whether there are other environmental dangers like volcanoes or geysers, we just don't know," Stern said.